When you need answers to a problem, our experts are here to suggest solutions. We look forward to working with you. Choose a question from the list below, or email us at ask@storesmart.com. What does "open long side" or "open short side" mean? Do you accept purchase orders (P.O.s) from schools, hospitals, or government agencies? Yes we do. Fax: 585-424-1064. Email: cs@storesmart.com. I want a custom printed item. How do I send artwork? 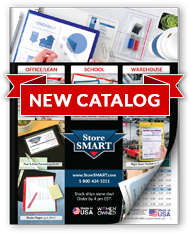 After you place your order on our website, you can email your artwork to cs@storesmart.com. Please click here to see our artwork instructions. What's the difference between "aggressive peel & stick" and "removable peel & stick"? Aggressive: Everything on our website that is called simply "peel and stick back" or "adhesive back" is aggressive. This adhesive bonds strongly to whatever surface it's attached to. It is difficult to remove. Great for long-term or permanent use. Remove and reuse: These pockets can be applied to a surface, then removed easily, then re-applied over and over. They leave no residue and cause no damage to the surface. NOTE: Not for use on real wood surfaces. How does shipping work? How much will it cost? Click here to see our full shipping policy and how we determine your shipping cost. Are the contents of the pockets included? No. We use example props to show you how our products might be useful to you. Unless otherwise noted, the inserts or contents of the pockets are not included.